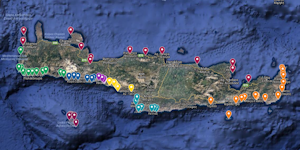 There are so many naturist possibilities in Southern Crete that the Captain has now split the old Southern Crete page into five. Gavdos Island - Ag. Ioannis, Lavrakas, Pyrgos, Potamos, Tripiti & Sarakiniko.